This core project continues one in our current NCRR grant titled "Volume visualization for analyzing cellular systems at multiple resolutions". Goddard TD, Huang CC, Ferrin TE. Visualizing density maps with UCSF Chimera. 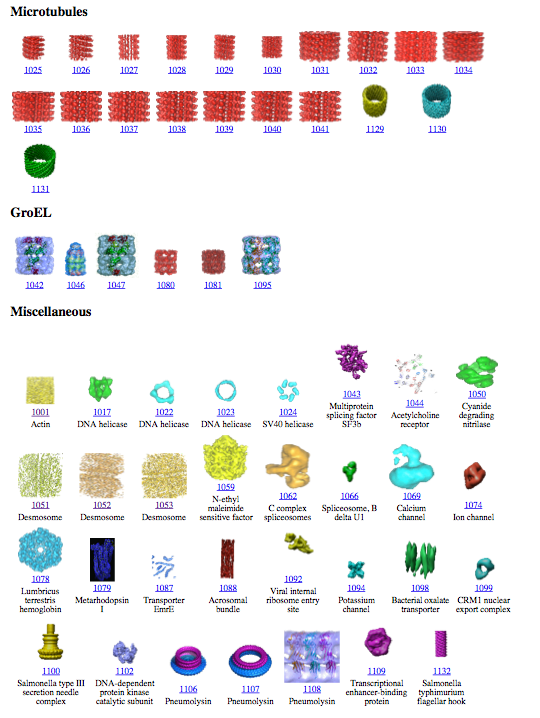 Software extensions to UCSF chimera for interactive visualization of large molecular assemblies. Describe 5-year vision and how far along we are in achieving that vision. See Chimera in action. Demonstration of capabilities for interactive analysis of large atomic models and electron microscopy density maps. Progress since grant submission. Additional slides describe progress since June 2006 emphasizing collaborative work. These will not be covered in talk. Project direction has not changed. 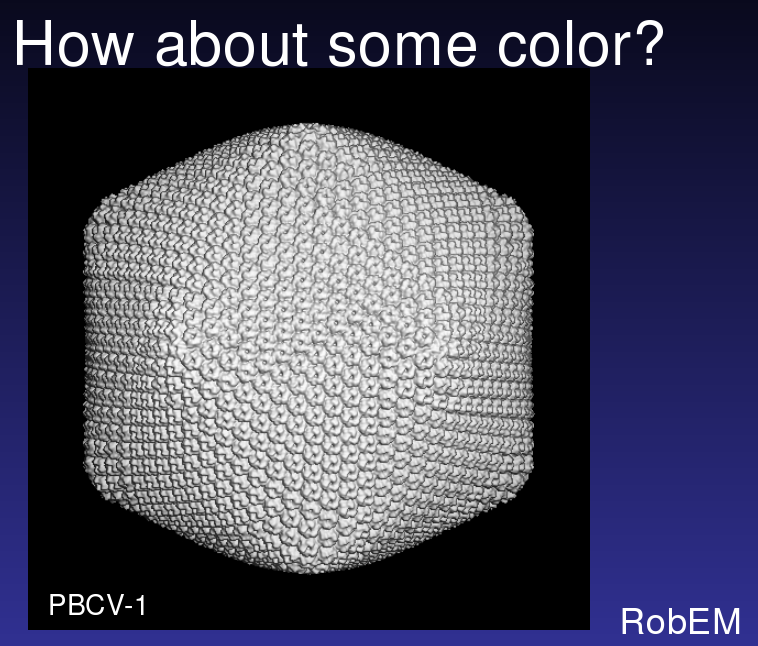 From Tim Baker talk, Large Biomolecular Complexes Visualization workshop, September 2005. 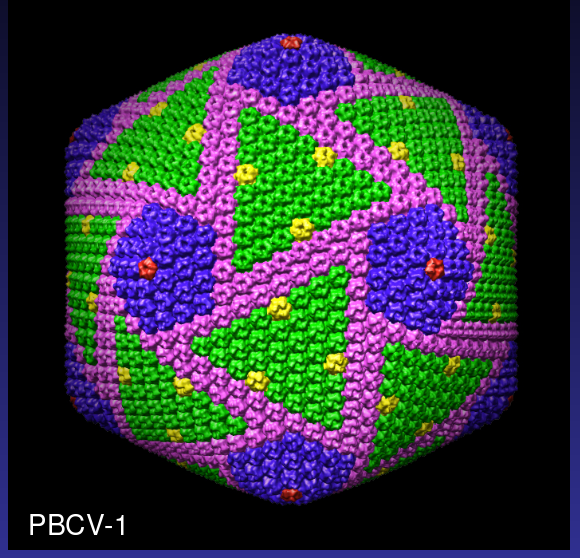 Color PBCV-1 virus map to illustrate symmetry. Ten computer programs needed -- several in-house utilities (RobEM, pif*), Situs, O, and Chimera. "I do not know if I make myself clear, probably not. It is really a kind of complex procedure." After workshop we began a collaboration with Baker lab. With Chimera additions in the last year this can be done entirely in Chimera taking half an hour instead of half a day. 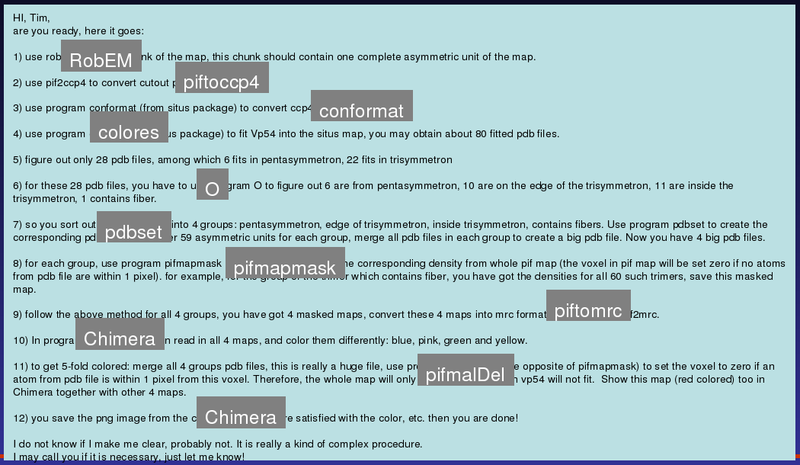 Goal of our project is to make common visualization and analysis tasks possible entirely within Chimera. This will enable studies of large assemblies by labs that do not have their own programmers writing in-house software. The main impact will be that more labs can pursue studies of large assemblies. 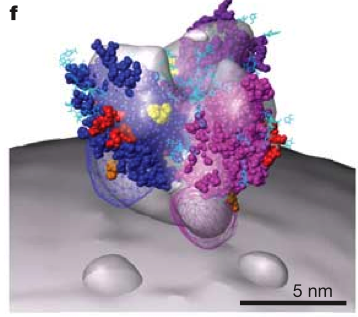 Our goal is to expand Chimera capabilities to encompass the common interactive visualization and analysis tasks in the study of large molecular assemblies involving atomic models and electron microscopy maps. We will continue our leading and highly unique role developing interactive software to supplant the patchwork of programs borrowed from other disciplines in current use for exploring large assemblies. Keywords: System integration. Highly collaborative work. Same-day prototyping. Multiple length scales. Real-time data exploration. User interface. Documentation. Thousands of users. Desktop computing. Not the Vision: Long-running computations. Special-purpose algorithmic code. Software for specialized hardware (computing clusters, volumetric rendering boards, ...). 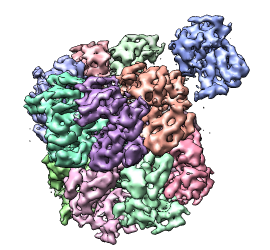 Approximately 500-1000 researchers currently use Chimera to study large assemblies, primarily by electron microscopy. Estimate is rough -- based on email and workshop contacts with ~100 users per year combined with Chimera registration statistics (~2000 voluntarily registered users, likely underestimates total users by factor of 2). 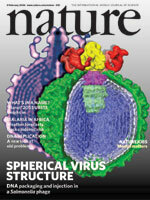 In 2006, three journal covers for Science and Nature depicted viruses, all three groups use Chimera for interactive analysis. We interact with all three groups, two being collaborators (Gabe Landers with Bridget Carragher, and Wen Jiang formerly with Wah Chiu, Jonathan Hilmer in Brian Bothner lab). The two public EM databases use Chimera as their primary visualization tool, and link to Chimera web site on each of their data set web pages. 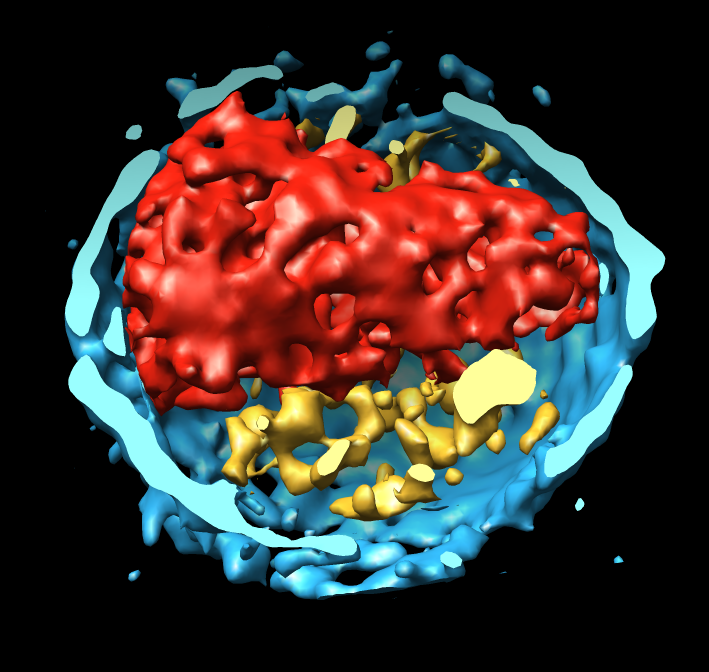 The two electron microscopy public databases are new and growing rapidly. EM DataBank (EBI) founded in 2002. Number of entries doubled in past year (currently 268). 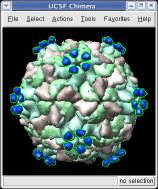 Virus Particle Explorer (VIPERdb) EM archive founded in 2004. Almost all database images created using Chimera. Labs can develop Chimera plugins to meet specialized needs, building on existing Chimera capabilities. 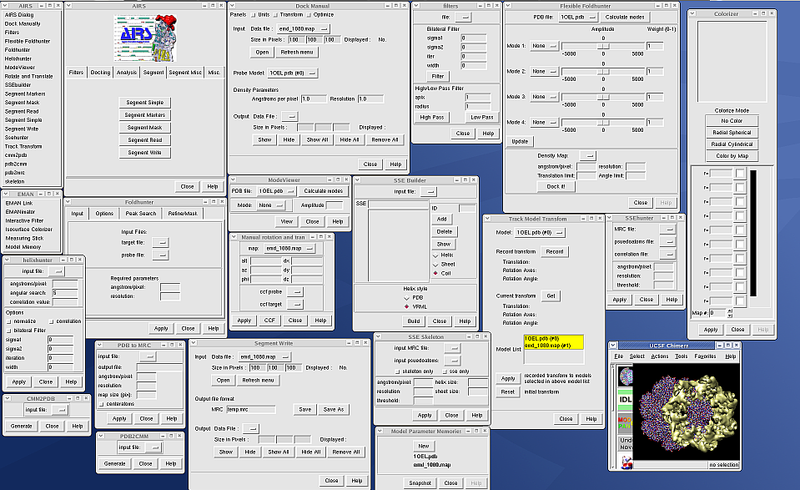 Example: 25 Chimera plugins developed by the National Center for Macromolecular Imaging and distributed with EMAN. User interfaces shown below. 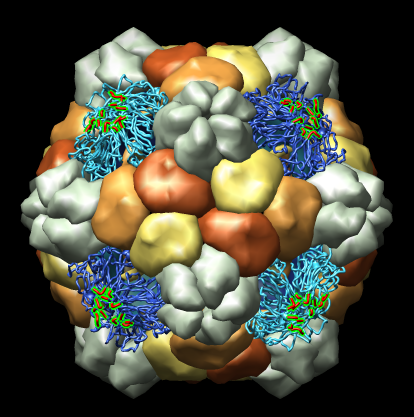 Chimera is the only widely distributed interactive analysis program focused on large assemblies and electron microscopy. Each lab uses many software packages because none encompass basic EM map and model capabilities. Volume visualization packages, commercial, targeting diverse fields medical imaging, earth sciences, oil/gas resevoirs, aerospace engineering, financial modeling, .... Have very limited molecular model capabilities. Amira - Focus on medical imaging. Excellent density map capabilities. 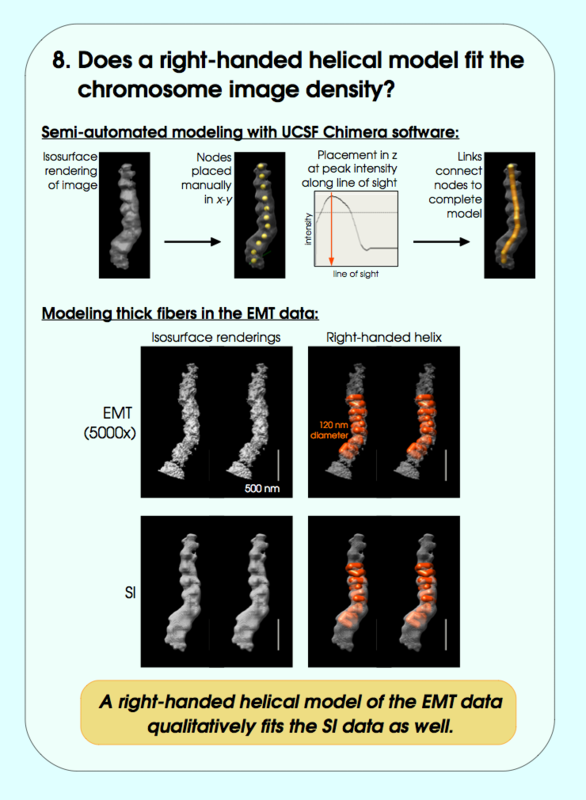 Limited molecular model features documented in 35 pages versus ~500 for Chimera. 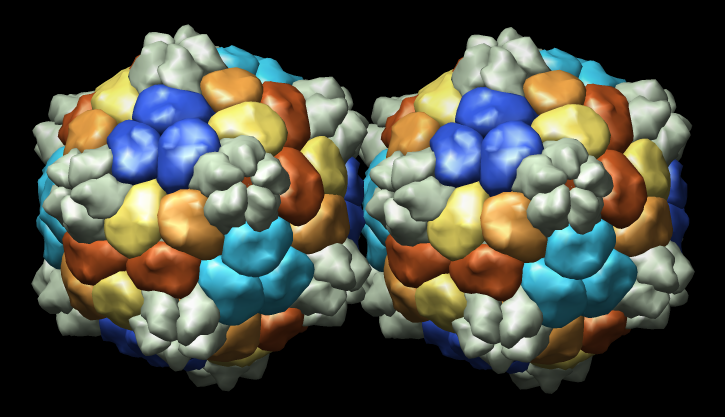 IRIS Explorer - Molecular model capabilities developed by Chiu lab (Baylor) have been abandoned. 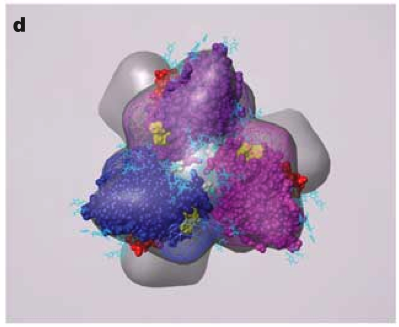 AVS - Molecular model capabilities developed by Olson lab (Scripps) have been abandoned. Vis5D - climate modeling (non-commercial). Demonstrated by Steve Ludtke five years ago for EM maps. Code recompiled for cube shaped EM maps instead of pancake shaped atmosphere maps. Molecular modeling packages. Have limited density map capabilities or specialized for atomic resolution crystallographic maps. O. Standard package for interactive model building in crystallographic density maps. PyMol. Drug binding, pharmaceutical industry focus. In-house EM map packages. Inadequate EM lab resources to develop and distribute program for wide base of users. RobEM. Michael Rossmann (Purdue), Tim Baker (UCSD, formerly Purdue). Priism. Dave Agaard, John Sedat (UCSF). 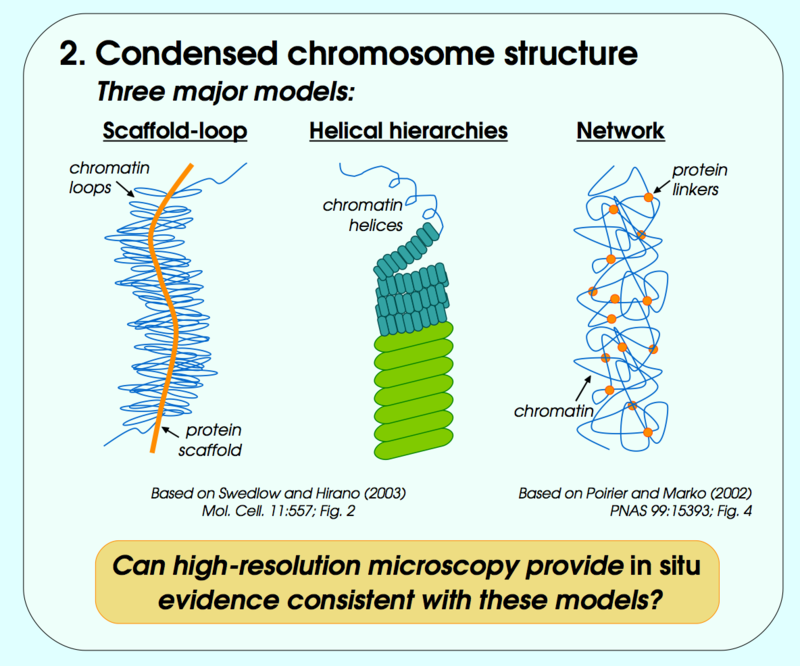 Require a range of map and model analysis capabilities focused on the organization of molecular assemblies beyond the atomic level: arrangements of molecules, domains, and secondary structure elements, their mechanisms of assembly and conformational rearrangements. 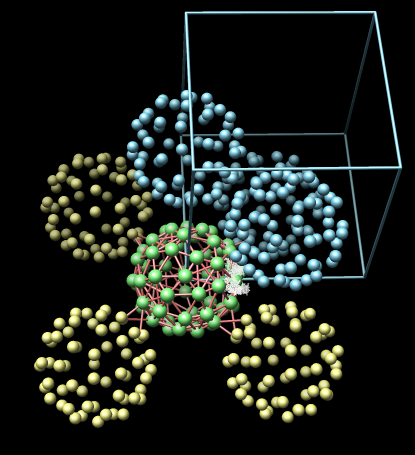 Buried surface area calculations for unique molecular interfaces. 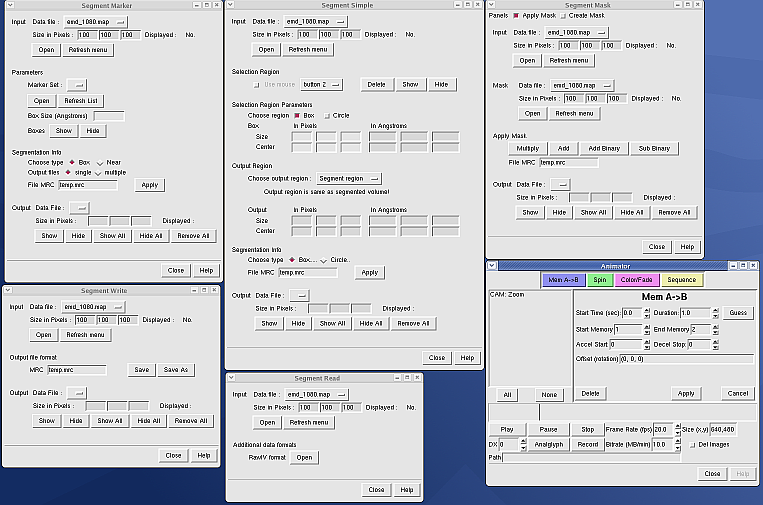 "Explode" subassemblies to examine interfaces. Finer and coarser grouping for surfaces. User interface improvements for exploring quaternary structure. Commands to create many types of smooth transitions: motion interpolation, fade in/out, color transitions, style transitions, motion with clash avoidance for any atoms, residues, domains, molecules, or subassemblies. Canned one-button movies: spin 360 degrees, move clip plane through map. 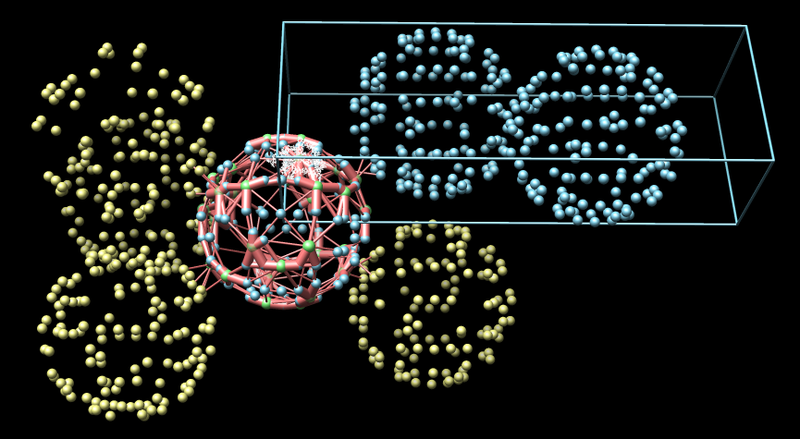 Steric clash avoidance in fitting atomic models. Fitting individual secondary structure elements and domains with energy minimization (core 1) to repair connections. Correlation measures between maps or map subregions and fitting maps into other maps. Masking with arbitrary surfaces, e.g. icosahedral shells. Optimizations for large maps (100 Mbytes - several Gbytes) on desktop computers. Map filtering and denoising (median filter, bilateral filter, inversion). 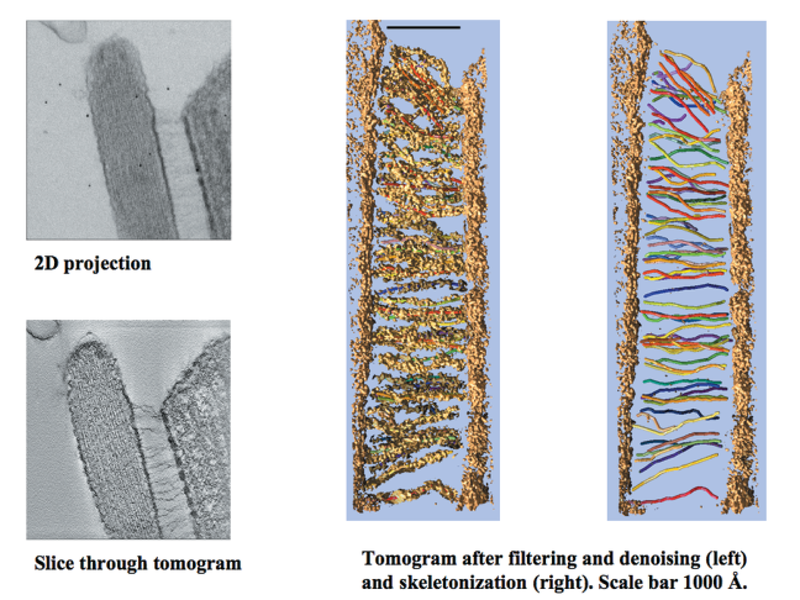 Segmentation of filaments using tubular paths. Measurements of angles, symmetry (e.g. helical pitch), masses. Volume time-series for in vivo light microscopy. Interactive and semi-automated feature tracking. 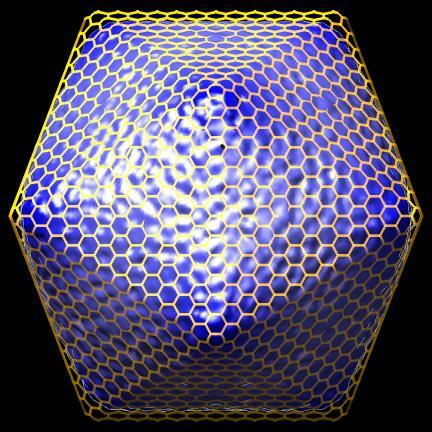 Large atomic-resolution model. 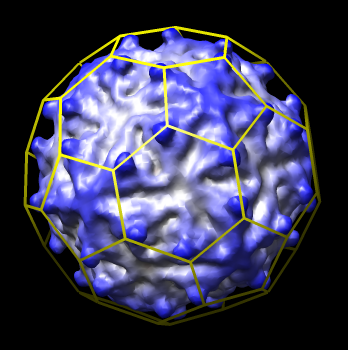 Examine Human Rhinovirus 2 contacts with a fragment of its cellular receptor. On web. Single particle electron microscopy map. 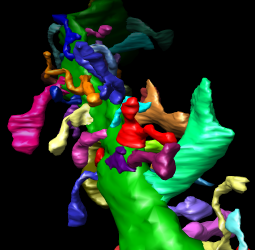 Fit a crystal structure in a myosin thick filament map. Electron microscope tomography. 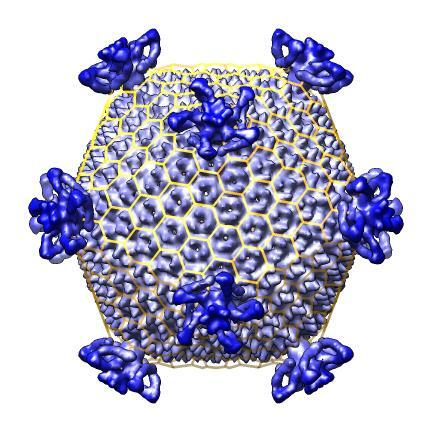 Segment the conical HIV1 core particle from enveloped virus. September 2006 chromosome EM tomography poster from Sedat lab. Chimera used for modeling helical structure. 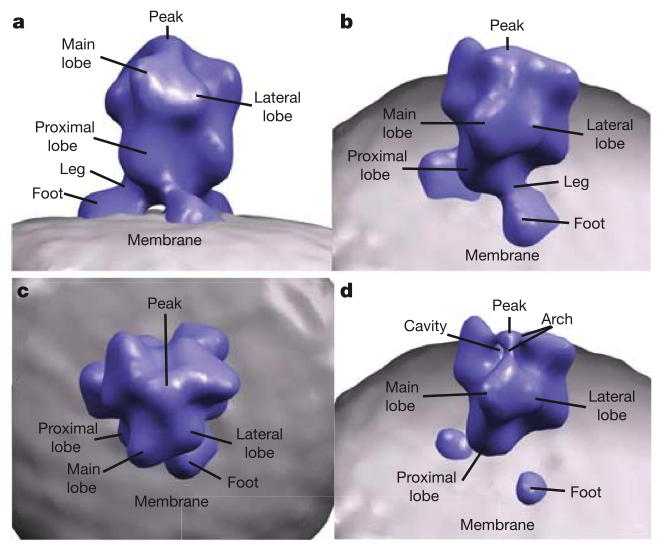 Recent poster showing EM tomography of haircell molecular mechanical linkers. Chimera used to model unknown linkers and fit candidate molecules. Example Chimera scripts and commands developed for collaborators since June 2006 grant submission. These are plugins distributed separately from Chimera on our experimental features web page. Scripts to auto-generate virus EM map images and movies, Padmaja Natarajan, Jack Johnson lab, Virus Particle Explorer Database (VIPERdb). Radially colored. Cut in half. Movie showing slab at progressive depths. 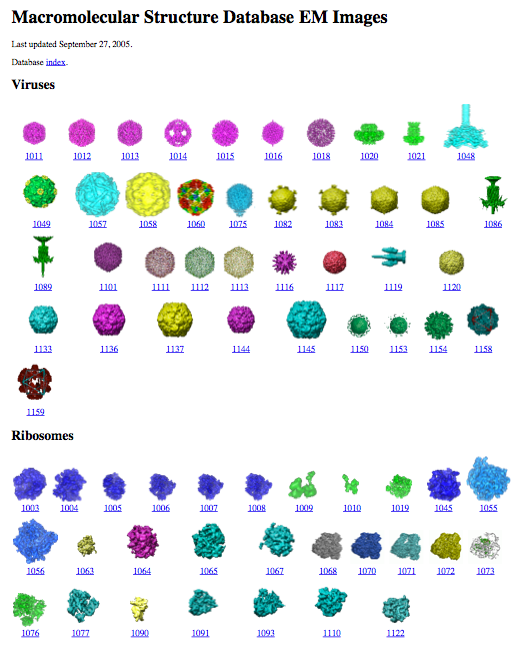 Create icosahedral schematic cages for virus capsids, Jinghua Tang, Tim Baker lab, also VIPERdb request. Display clashes between asymmetric units in crystals and biological assemblies, Cathy Lawson, Protein Data Bank (PDB). 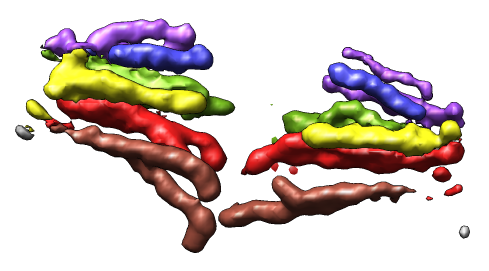 Split density map into separate map for each color, Steve Ludtke, National Center for Macromolecular Imaging (NCMI), and used for John Sedat lab chromosome data. Neural dendrite spine length measurement, confocal microscopy, IMOD segmentation file reader, Maryann Martone, National Center for Microscopy and Imaging Research (NCMIR). Many collaborations outside UCSF have been established by attending meetings and giving talks. Here are examples from the past year. Large assembly visualization workshop, UCSD, Sep 2005. Met Tim Baker. All experimentalists at meeting using Chimera. Automated Molecular Imaging Forum, Dec 2005. Spent 2 days with Baker lab initiating collaboration. Met Bridget Carragher, NRAMM director. Biophysical Society Meeting, Salt Lake, Feb 2006. Worked out database viewer collaboration with Bridget Carragher, NRAMM. BioImage Informatics, Santa Barbara, July 2006. Possible Maryann Martone, Mark Ellisman NCMIR collaboration, microscopy of dendrites. We host collaborator visits. VIPERdb visit from Padmaja Natarajan, Aug 2006. Day long discussion of possible new tools. CryoEM Standards Task Force, Fall 2006, teleconferences. 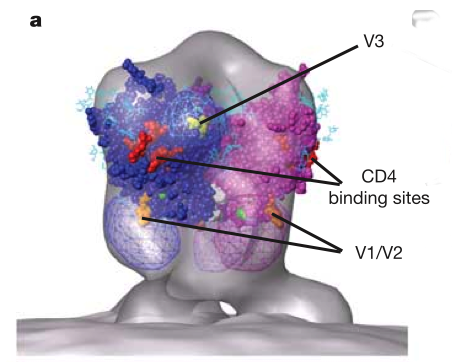 Involves several existing collaborators: Henrick (EBI) / Berman (PDB) / Chiu (NCMI). Future: CryoET of Cells workshop, Max Planck Institute, Dec 2006, hosted by Wolfgang Baumeister. 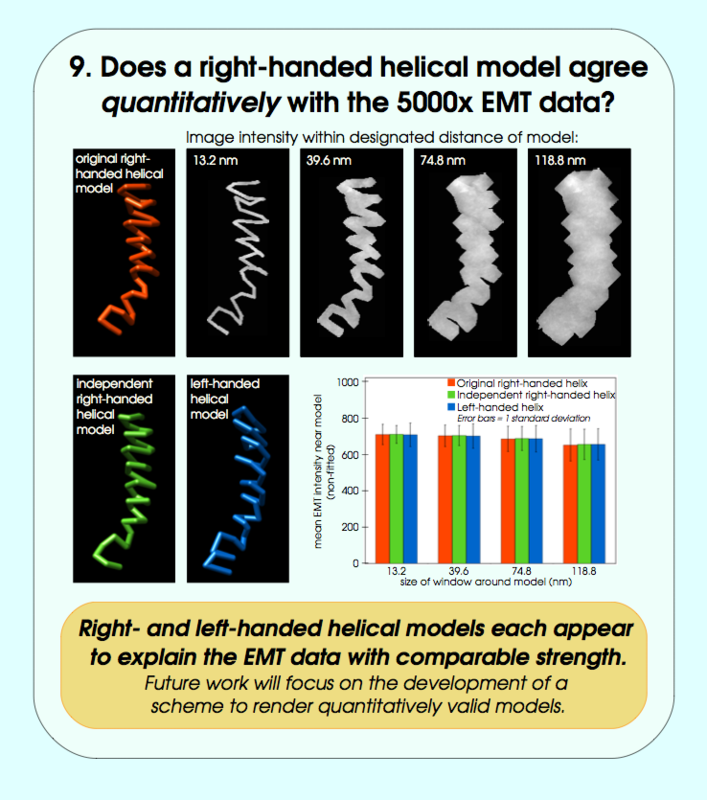 They wish to develop EM tomography extensions for Chimera. Collaborations with public archives are important for success of Chimera and the databases. 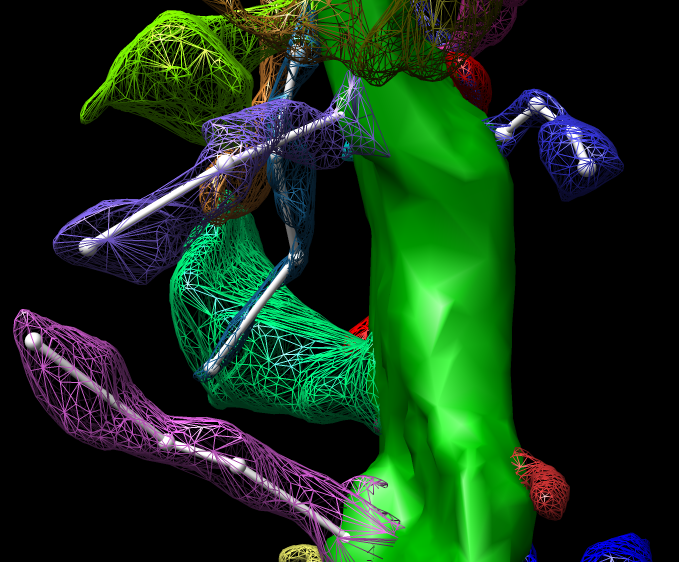 Omitted collaborations with EMDB and VIPERdb public electron microscopy databases from grant proposal. Protein Data Bank. Cathy Lawson, Helen Berman (RCSB). Remediation of biological unit and crystal unit cell meta-data. Electron Microscopy Databank. Richard Newman, Kim Henrick (EBI). Density map formats, meta-data, and web images. 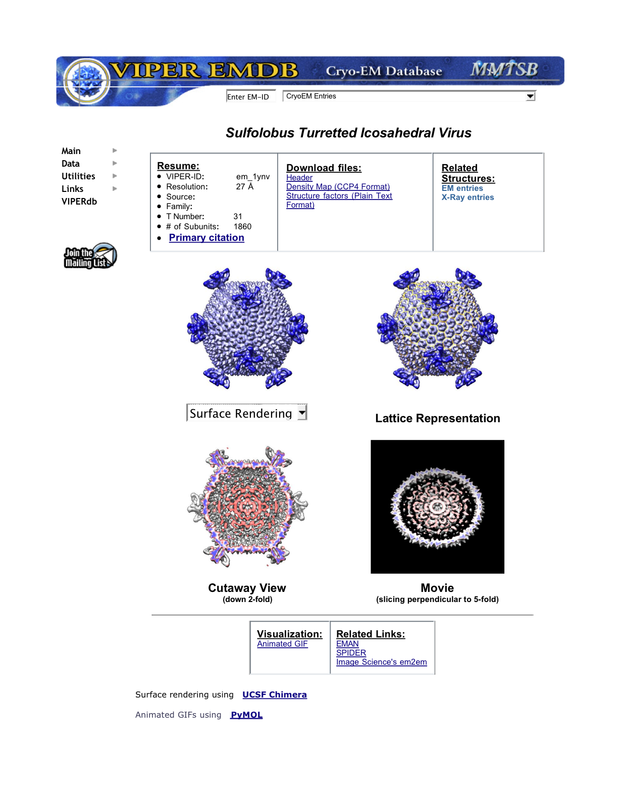 Virus Particle Explorer Database. Padmaja Natarajan, Jack Johnson, Vijay Reddy (MMTSB resource). Automatic image generation for atomic models and EM maps. 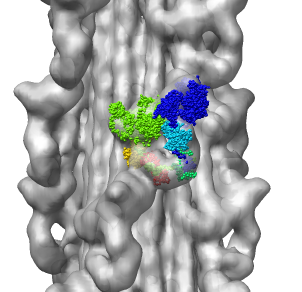 EMDB and VIPERdb database web pages link to Chimera web site. Broad aims of large assemblies core project listed in our June 2006 grant proposal. 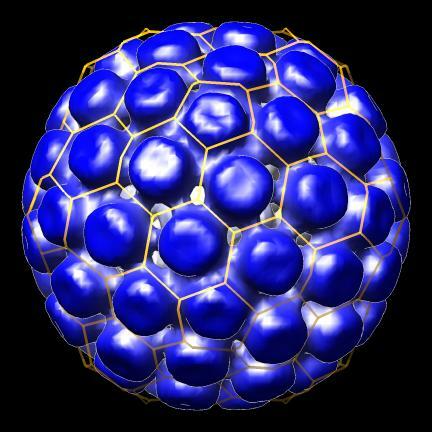 Display and manipulation of atomic models comprised of tens to thousands of macromolecules. 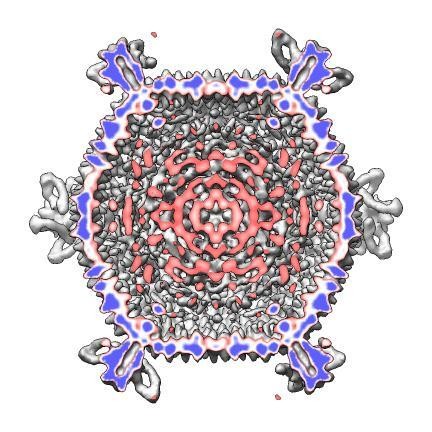 Creating animations of assemblies such as virus capsids and ribosomes that elucidate structural organization and conformational changes. Display and analysis of medium and low resolution density maps intended primarily for researchers studying molecular assemblies using electron microscopy single particle reconstruction. 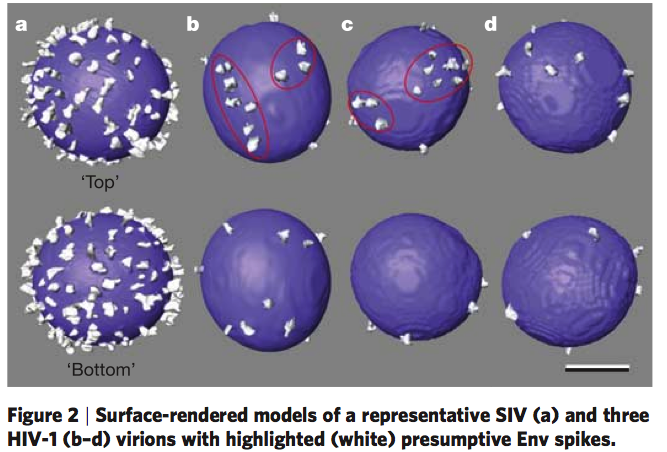 Analysis of structurally heterogeneous assemblies, for example chromosomes or polymorphic viruses such as HIV, imaged by electron microscope tomography.